Nigella Lawson is a domestic goddess and I regularly consult her cookbooks – both for recipe ideas and because her writing/cooking style is a pleasure to read. Tonight’s dinner was a riff off her Buttermilk Roast Chicken. Instead of the garlic, cumin and maple syrup, I only used herbes de Provence as my seasoning with the buttermilk. As a rule of thumb, the longer you soak the chicken in the buttermilk brine, the better it will be. 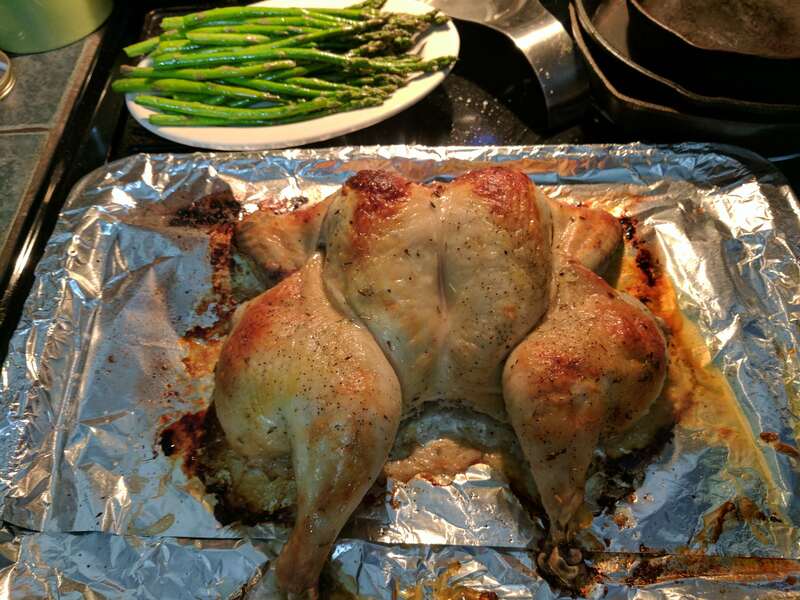 Her original recipe was for drumsticks and for 2 hours – with a whole chicken, I recommend a minimum of 4 hours or, better yet, overnight. Cut out the backbone of the chicken and crack the breast bone so it will lay flat. Set aside the backbone for use in stock. Mix together the buttermilk and herbes de Provence. Place the chicken in a gallon zip top bag and pour over the buttermilk mixture. Seal and set in the refrigerator for at least 4 hours and as long as 24. About an hour before cooking, remove the chicken from the brine and drain well. Coat the chicken with the olive oil and sprinkle on the salt and pepper. Preheat the oven to 425 degrees F. When ready to cook, cover a roasting pan with foil and set the chicken on it breast side up. Tuck the wing tips under the breasts to keep from overcooking. Roast for 30 minutes before dropping the temperature to 350 degrees F for an additional 30 minutes. Check for doneness (internal temperature should be 165 degrees F for the thighs and 160 degrees F for the breast). Let rest for 5 minutes before cutting and serving. As you can see, we ate our chicken with asparagus that I had tossed in olive oil and a little salt and then cooked on a grill pan until tender but still a little crunchy. 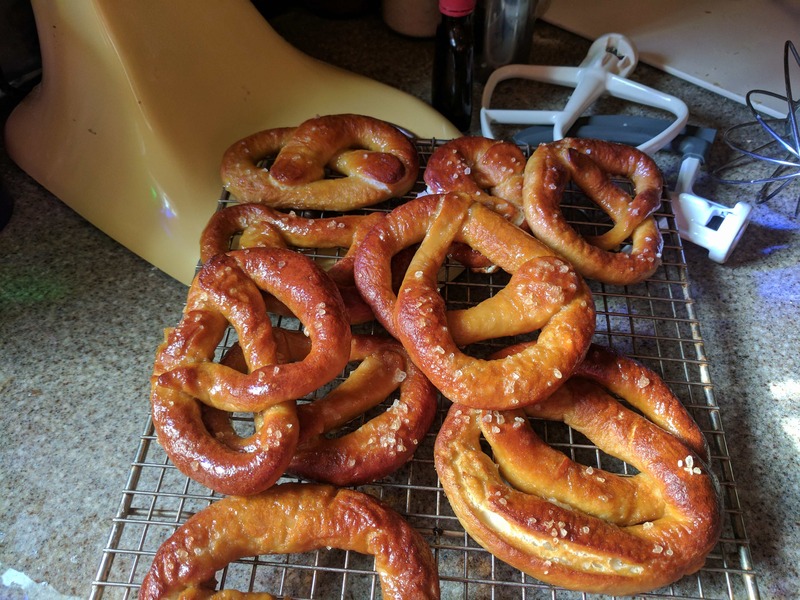 With our sourdough starter going strong, I decided to try my hand at sourdough pretzels. I wanted something like you’d get from a street vender: chewy and great tasting but minus the concerns about sanitation. Add all the ingredients together in a stand mix with the dough hook attachment. Knead on medium speed until the dough comes together and becomes cohesive but still slightly sticky. Cover the dough and let rest one hour. Gently fold to deflate. Cut the dough into 12 pieces. Roll out each piece of dough into a 24-inch rope. Make a U-shape with the rope, holding the ends of the rope, cross them over each other and press onto the bottom of the U in order to form the shape of a pretzel. Set each pretzel on a parchment lined baking sheet. Cover and let rise in a warm place for 1 hour or until puffy. Bring to a boil 10 cups of water. Sprinkle in 2/3 cup baking soda. Place the pretzels into the boiling water. Boil for 30 seconds. Remove from the water and return to the baking sheet. Brush the top of each pretzel with the beaten egg yolk and water mixture. Sprinkle on the pretzel salt. Bake at 400 degrees F for 20 minutes or until dark golden brown. Brush the tops with melted butter, if desired. Michelle did a few variations on a sweet glaze. Add all dry ingredients to the melted butter and water. warm in microwave until sugar and salt are dissolved. Stir in vanilla and honey. After 15 minutes of pretzels baking, brush on and finish cooking. Add ingredients together and warm in the microwave until sugar is dissolved. If needed, add 1-2 more teaspoons of water to thin the glaze. Brush on the glaze with five minutes of baking left. Bruch more glaze on after the pretzels come out of the oven. I received from my friend Gillian a packet of Goldrush San Francisco Sourdough Starter a few months ago. As the necessities for the care and feeding of starter can become burdensome if you don’t bake bread every few days (or are willing to toss out a cup every few days), I decided to wait until cooler weather to begin the process. It took a few days but now that we’re finally beginning to bake from it, I decided to make herbed bread that I first read about in Breaking Bread with Father Dominic, which was incidentally my first bread making cookbook. The original had caraway seeds, sage, nutmeg and whole wheat flour, none of which I cared to use. 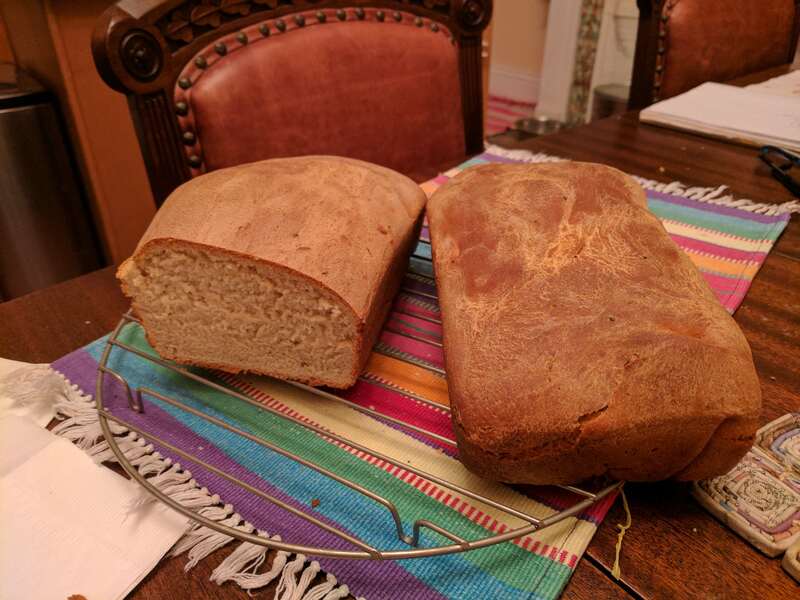 I just loved how the smell of baking bread and rosemary filled the house as these loaves cooked and the finished product tastes pretty darn good, too. Make the sponge and let it sit on the counter, covered in plastic wrap overnight or up to 72 hours. The longer you let it develop, the more distinctive the sourdough flavor will be in your final bread. Proof the yeast in the warm water for several minutes. Add all the ingredients to the sponge and mix together in the bowl of a stand mixer. Knead the dough for about 10 minutes. Coat in oil and let rise for 2 hours in a warm place. Once the dough has doubled in size, dived into two loaves and put into well oiled loaf pans. Let rise for 2 hours more. Preheat oven to 375 degrees F. Bake loaves for 45 minutes to 1 hour or until they turn a dark, golden brown. Breads with honey can darken too quickly, so you might need to cover the top with aluminum foil for the last 10 to 15 minutes of baking. Remove from the pans and cool on racks. I recently picked up a copy of the Picayune’s Creole Cook Book that was originally published in 1900. It is still a popular title today with its recipes from New Orleans’ past. I thought this would be a perfect way to the end the year – homage to the past as we step into the future! 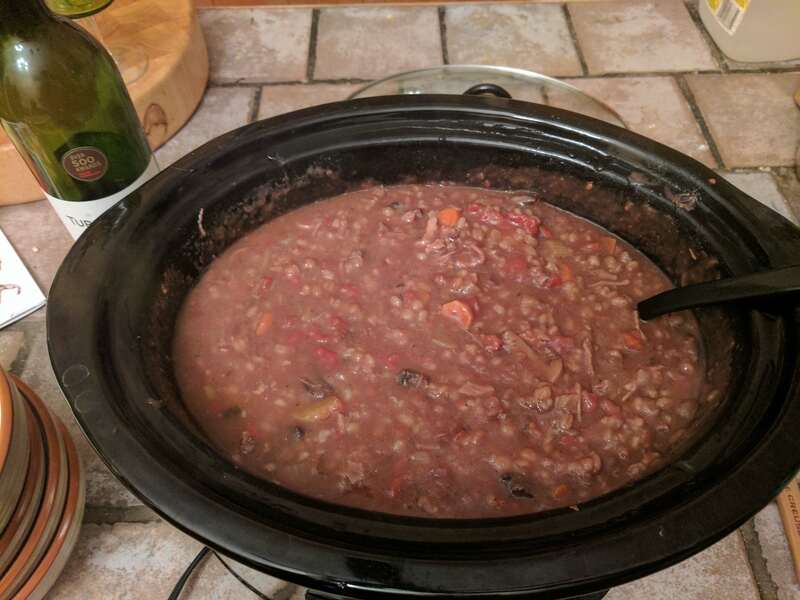 I used their recipe for Ox Tail a la Bourgeoise (pg 87) as a jumping off point for my own oxtail mushroom barley soup (I hate peas and turnips, so I left them out while adding things I do like). Needing to do some chores outside, I made it in the slow cooker. Also, I added the wine in too batches as some of the flavor (in addition to the alcohol) cooks out over long simmers. Adding a bit more wine before serving lends a brightness to the dish. Brown oxtail pieces in a skillet before transferring to the slow cooker. Sauté onion in the fat remaining in the bottom of the pan until onion is translucent, about 5 minutes. Add in garlic and sauté until fragrant, about 2 minutes. Add in the celery, carrots and stir to combine. Use a slotted spoon to place veggies into the slow cooker so as to leave some fat in the pan. Put the mushrooms into the skillet. Cook until some of their moisture has been released. Place them into the slow cooker. Pour tomatoes, 1 cup of the red wine and stock into the slow cooker and stir well. Add in seasonings. Set the slow cooker on high until it comes to a boil. Turn to low and cook for 4 to 6 hours or until barley is soft and tender. Cut any remaining meat off the oxtail and return the meat to the soup with the remaining cup of red wine. Taste for seasonings. Remove bay leaves and serve with bread – I made a batch of fresh corn cornbread to go with (recipe HERE).